My family originated from a small island in the Caribbean called St. Thomas. This island is one of three islands that combined are called the U.S Virgin Islands. We were blessed enough to travel together to St. Thomas and visit where my grandparents were born and raised. Nine of us connected with each other and connected with the island in the most amazing family reunion ever. A few years ago I visited St. Thomas with friends and stayed at the Sugar Bay Resort and Spa which is now called Dreams Sugar Bay. I thought it would be the perfect place to bring my family because it was a beautiful resort and it catered to families and couples. Dreams has seven restaurants, four bars, free water sports such as kayaking, a basketball court, a tennis court, a spa, a pool with a swim up bar and is also a great location for weddings. The rooms are very cozy and include a balcony which is my favorite part. My family loved the resort. St. Thomas is a gorgeous island. The views are picturesque, the beaches are tranquil and the people are friendly. But this trip was to enjoy the beauty of the island and also visit all of the places my grandparents told us about in their stories of growing up. So we rented two cars and took a full day to explore the island. We stopped for gas in an area called Sugar Estate and I hopped out the car when I saw a beautiful mango tree. The area was filled with colorful homes and flowers. The first official stop we made was in a neighborhood called Savan. Growing up my grandparents lived in Savan. Savan is not a tourist attraction nor is it a safe part of the island but we were able to connect with it and see the beauty through the eyes of grandparents. Most of the actual homes my grandparents lived in were gone but we got the general picture. In my opinion, I loved the roughness of Savan. Next we visited a family friend. My great grandmother’s best friend. She lives in an area called Lerkin Lund. She has one of the most beautiful views that I’ve ever seen and she shared some mangos with us that were picked on the island. Our tour continued, we stopped at my late great aunt’s house. She is the sister of my great grandmother. Her house is located in a part of the island called Estate Pearl. By this time we were all hungry and tired so I reached out to some of my local friends and they told me about a restaurant called Cuzzin’s. I was told if you’re looking for authentic Caribbean food, this was the place to go. Cuzzin’s was delicious, I ordered the Seafood Combo and I also stuck my fork in everyone else’s plate. I tried the conch and the salmon as well. All of it was delicious. Our trip didn’t end with just a family roots tour. We also swam in Magen’s Bay which is the most beautiful beach I’ve ever been to. My cousin’s, sister and I hung out in Red Hook, a popular area with bars. In this area is Señor Frogs and the popular bar of the island called Duffy’s Love Shack. We also visited the highest point in St. Thomas, a tourist attraction called Mountain Top. There is another popular restaurant on the island called Gladys Cafe. I wasn’t able to eat there this time but I will when I return. We also walked around the Waterfront. The Waterfront is where you can find shops, restaurants and vendors on one side and the beautiful waters where the cruise ships doc on the other. This trip was the most amazing trip I’ve ever taken. Absolutely nothing compares to the beauty of bonding with your family and connecting to your roots. While on my vacation to St. Thomas I visited two of the most beautiful beaches I’ve ever been to in my life. You may or may not know this but my mother’s side of my family are from St. Thomas so I grew up hearing stories about these beaches. I visited St. Thomas years ago but I never had the opportunity to actually lay on the beach and enjoy it. They are absolutely beautiful, breathtakingly beautiful. The two beaches I visited were Magens Bay and Coki Point. 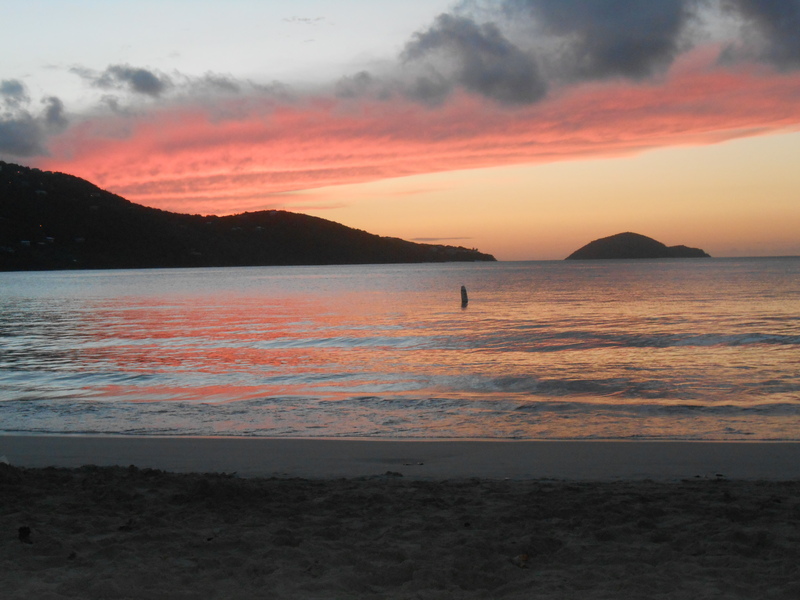 If you visit St. Thomas, make sure you go to these two beaches. On the Sunday after Carnival, Magens Bay has a big celebration cookout. It includes food, music, drinks and a small parade. It’s a nice way to end the Carnival festivities. Coki Pt has a small restaurant close-by called Restaurant 39. The owners made us feel extremely welcome and specially prepared each of us a meal. For $15 I got shrimp, pasta, mashed potatoes, rice and corn. If you visit Coki Pt make sure you stop by. It was Carnival time in St. Thomas and a few friends and I stayed in the Sugar Bay Resort and Spa. The resort is beautiful, our room had a great view of the resort’s pool, beach and restaurant area. Our all inclusive package included unlimited drinks, unlimited food, access to all of the resorts amenities and a $100 spa credit. So of course, I ate and drank nonstop and ended my stay with a well needed manicure and pedicure. Pure heaven! The resort staff was overall very friendly and catered to our needs. (We did have a problem with housekeeping though, they were delayed on giving us new towels, cleaning the bathroom and changing our linen. After we spoke to them, this problem was solved.) Other than that issue, the bartenders were friendly and generous with the alcohol portions. That is extremely important when you are on vacation. My favorite part of this resort was the outside eating area that overlooked the water. I dragged my friend to eat with me outside as much as I could because it was absolutely breathtaking. Overall, I do suggest that you stay at this resort should you visit St. Thomas. I will be honest and say that it is not necessarily the best location if you are going for Carnival because it is far from all of the events in the village/town. If you don’t mind taking a cab (which could be anywhere around $10 each way depending on where you are going), or you are renting a car, or have a friend/family member with transportation then staying here would be okay during Carnival. Wherever you choose to stay, St. Thomas should be on your list of vacation spots to travel to. I promise, you will love it! And lucky for you, I just found a great deal on Cheap Carribean for an all inclusive four day with airfare package.